Introduction: The use of human fibrin glue in anastomosis of the facial nerve have been an option rather safe and quick for surgeons. Objective: To evaluate the use of the glue of human fibrin glue in the anastomosis of the facial nerve in a series of 42 patients who had suffered partial injury from the facial nerve in the intratemporal segment and they had been treated by three different techniques of anastomosis. Method: A retrospective study on 42 patients who presented partial lesion on intratemporal segment of facial nerve. Patients were divided into three groups: interposition of partial graft on the injured area of the nerve (group 1 - 12 patients); to keep the preserved part and perform tubulization (group 2 - 8 patients); to divide parts of injured nerve (proximal and distal) and place total graft of sural nerve (group 3 - 22 patients). Results: Results lower or equal III on House-Brackmann scale were: 1 (8.3%) patient on group 1; 0 (0.0%) patient on group 2 and 15 (68.2%) of patients on group 3 (p>0.001). Discussion: The best surgery technique for partial lesion therapy of facial nerve is still questionable. The use of the fibrin glue has shown resulted similar to the suture with points. Conclusion: The use The use of human fibrin glue showed to be efficient in the accomplishment of these three different anastomosis types of the facial nerve. Among these 42 patients, the best achieved results were from total graft of facial nerve when comparing to others. Traumatic lesions on the intratemporal segment of the facial nerve can be caused by temporal bone fractures, firearm injury or iatrogenic injuries or during otological surgeries1-2-3. The number of iatrogenic injuries has been decreasing due to the constant improvement by the otological surgeons and also to the popularization of the facial nerve intra-operative monitoring. Although that number has been reduced, many patients have been searching treatment in our service for the past fifteen years. On the other hand, other types of etiologies as traumatic injuries of this nerve have been increasing, especially in big cities, due to the violence raise (car accident, falls, terrorism and urban violence). Our hospital is a reference of traumatic emergency cases that occur in the city of São Paulo and it is also a tertiary reference center in the country - Brazil. When an injury or total section (neurotmesis) occurs, the end-to-end anastomoses are the alternative to be chosen; when an extensive loss of the substance occurs, the anastomosis by using nervous graft is recommended. In case the nerve undergoes a partial lesion on its fibers and the intact fibers remain, should surgeons preserve the fibers that are still intact or section the segment and insert the autologous graft between stumps? 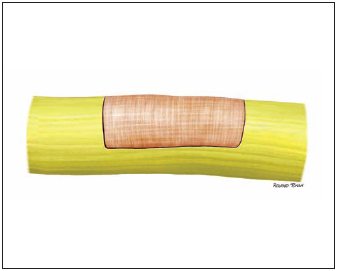 If fibers are preserved, should surgeons insert partial graft or leave the stump partially injured by performing a tubulization? Recovering an injured tissue through a simple "gluing" is a topic that Medicine has always been searching. YOUNG and MEDAWAR, in 1940, were the first to describe the use of "glue" for nerve anastomosis stabilization by using blood as adhesive agent4. Since then, this topic has been intensively studied. Collagen and cyanoacrylate has also been used for the same purpose, but cyanoacrylate on nerve anastomosis was disregarded due to the intense tissue reaction caused by it. The use of human fibrin tissue adhesive has become quite common in different types of surgeries. It is produced and traded by some pharmaceutical laboratories. The fibrin tissue adhesive is made with freeze-dry human blood which are submitted to antigen tests. The freeze-dry adhesive is composed by human proteins. The freeze-dry material that is needed to obtain 1ml of adhesive solution consist of: 75-115mg of protein that can be coagulated; 70-110mg of fibrinogen; 2-9mg of fibronecitin; 10-15 units of factor XIII; 20-80mg of plasminogen. This concentration of substances is dissolved into 500 KUI/ml bovine aprotinin, so the adhesive can be better solidified, and, then, it is added to a 500 UI freeze-dry thrombin solution diluted in 40mMol calcium chloride (CaCl2 / l). The adhesive contains fribrinogen in solution 1, which when in contact with solution 2 (thrombin and calcium chloride) changes the fibrinogen into aggregated fibrin monomers. The factor XIII of solution 1 connects fibrin monomers to fibronecitin (of the solution 2), resulting a solidified component after one minute. Plasminogen is the component 1; when this undergoes action of activators present on tissues, it is converted into plasmin (an enzyme that degrades the fibrin), by dissolving the clot. The aprotinin is used to prevent plasmin action and to control its degradation. The aprotinin action remains working for 8 days, providing a cicatrisation before the clot absorption. The purpose of this study is to evaluate the result of the use of human fibrin adhesive in anastomosis of facial nerve in 42 patients who suffered from partial lesion on intratemporal segment of the facial nerve. These patients were submitted to three different anastomosis approaches. Forty two patients underwent a retrospective study between 1988 and 2005. They presented traumatic peripheral facial paralysis. During surgery procedure, when the facial nerve was explored, it could be noticed that 30% of the facial nerve diameter was preserved. Transmastoid access was performed in all patients and they had a one-year post surgery follow-up. House-Brackmann (HB) scale was used to evaluate pre and post-surgery results. The criteria for selecting patients were: patients with injury for less than one year; peripheral facial paralysis type HB V or VI and 90% of nerve degeneration on electroneurography on the three facial parts (frontal, orbicularis oculis and orbicularis oralis) and/or electromyography with no signs of reinervation. All surgeries as well as anastomoses (partial or total) were performed by the same surgeon (main author), according the technique previously described by him and fixed with fibrin adhesive4. 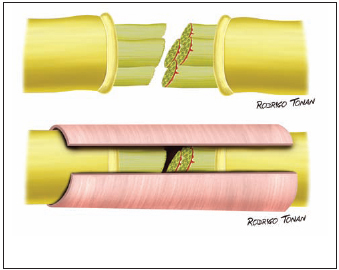 Tubulization was performed with temporal muscle fascia by totally involving the injured segment of the nerve. Medical files were analyzed in order to determine etiology; paralysis and post-trauma surgery period; type of surgery; facial segment where injured laid; injury extension at facial nerve length; injury extension on the nerve diameter; presence or absence of the neuroma and clinical condition of the patient one year after surgery. All neuromas were removed during surgeries (Picture 1). Picture 1 - Example of amputation neuroma. The segments of the involved nerve were divided into: labyrinth portion (first segment); tympanic portion (second segment); mastoid portion (third segment) and tympanic + mastoid portions (second and third segments). Injury length was also divided into: less than 5mm; 6 to 10mm and more than 10mm. The nerve diameter on injured part was also classified into: less than 50% and more than 50%. A 30% preservation of the nerve diameter on the injured segment was one of the criteria for the inclusion on this report. All of the cases which have been selected for this study presented up to 70% of the diameter of the injured nerve and at least 30% of the diameter of the preserved nerve. Regarding types of surgeries, patients were divided into three groups: group 1 - twelve cases of insertion of partial graft on the preserved area of the nerve (Picture 2); group 2 - eight cases in which the preserved part was kept and tubulization was performed with temporalis muscle fascia (Picture 3), and group 3 - twenty-two cases in which parts of the injured nerve (proximal and distal) were sectioned and total graft of sural nerve was inserted (Picture 4). Picture 2 - Type of partial graft. Picture 3 - Total graft of the facial nerve (with sural nerve). 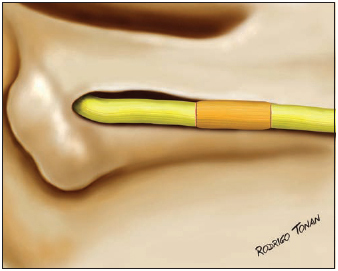 Picture 4 - Type of total graft of the facial nerve. Distribution of patients according to gender and age did not present a significant statistical difference. 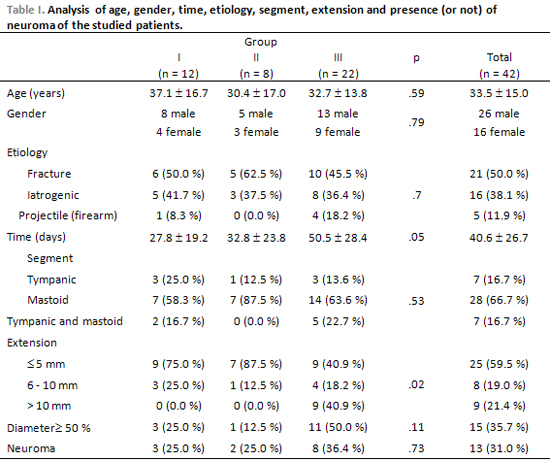 Temporal bone fracture was the most common etiology followed by iatrogeny and firearm projectile in all groups (p=0.7) (Table 1). The period between injury and surgery was around 27.8 (±19.2) days for group 1; 32.8 (±23.8) for 2 and 50.5 (±28.4) for group 3 (p=0.05) (Table 1). Mastoid segment was the most affected in all groups, as it follows: 58.3% (7) of patients from group 1; 87.5% (7) of patients from group 2 and 63.6% (14) of patients from group 3. Tympanic segment was affected in 25.0% (3) of patients from group 1, 12.5% (1) and 13.6% (3) of patients from group 2 and 3 respectively. Patients affected in both tympanic and mastoid segments accounted for 16.7% (2) of group 1; 0.0% (0) of group 2 and 22.7% (5) of group 3 (p=0.53) (Table 1). There was no injury on labyrinth segment of facial nerve. Regarding injury length of the nerve, 75.0% (9) of patients from group 1 presented injury ? 5mm; 25.0% (3) presented injury between 6-10mm. In group 2, 87.5% (7) of patients presented injury ? 5mm and 12.5% (1) presented injury between 6-10mm. There was no injury larger than 10mm in groups 1 and 2. Yet, in group 3, 40.9% (9) of patients presented injuries ? 5mm; 18.2% (4) presented injuries between 6-10mm and 40.9% (9) of them presented injuries larger than 10mm (p=0.02) (Table 1). Fifteen (35.7%) patients had more than 50% of the diameter of its facial nerve injured (p=0.11). Only 31.0% (13) of patients presented facial neuroma. 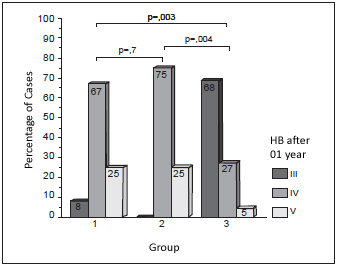 Regarding results one year after surgery, group 1 66.7% (8) of patients presented HB IV and 25% (3) presented HB V. In group 2, 75% (6) of patients presented HB IV and 25% (2) of them presented HB V. In group 3, 27.3% (6) of patients developed HB IV and only 4.5% (1) presented HB V (p=0.001) (Chart 1). Chart 1 - Results displayed on House-Brackmann scale, 1 year after surgery. Temporal bone is easy to be affected under head and neck injuries due to its position, what can cause peripheral facial paralysis5-6(PFP). The difficulty in comparing cases of PFP surgeries is not only due to injuries variations, but also due to the difficulty in having groups with similar injuries in order to be able to perform systematic comparisons. In accordance with other authors, we report that early surgery therapy (up to 3 weeks from the beginning of the paralysis) presents better results 1-6-7-8-9. Most of our patients search for therapy at least 60 days after PFP has started. We believe that patients would have better results if they were early treated. It is our routine to submit patients with temporal bone trauma and PFP to CT scan of the temporal bones, audiometric tests, electroneurography (ENoG and EMG). Based on studies by Fisch6, we believe that the use of ENoG/EMG provides reasonable information on when to operate. All degree scales for PFP are subjective and with imperfections. HB scale is easy and well accepted by professional10-11. Surgery approach depends on the surgeon and patient. In our department, we prefer the transmastoid access on patients with intratemporal injury. Once diagnosis shows that the injury affects the geniculate ganglion or labyrinth segment, we choose translabyrinth approach (if patient presents anakusis), via middle fossa1-12 (if audition is preserved) or combined one13, depending on injury location. Anastomosis must be performed if total or partial disruption occurs. It is important to avoid the closing under tension; and when there is an injury causing extensive length loss of neural tissue, we prefer to perform graft with sural nerve. The use of human fibrin adhesive has become essential in several surgeries of different medical fields. Many authors report achieving good results by using it. BOEDTS and BOUCKAERT (1984)14 reported that the quality of recovery and repair of an injury on the nerve depend on the amount of fibrosis that is formed during anastomosis process. However, fibrosis depends on the level of conjunctive tissue; on a good vascularization of the repair area; on the absence of local infection; on the type of material used for suture; on the reaction of foreign body this material may cause; on the number of stitches and anastomosis tension and localization. Based on studies on sciatic nerve, these authors compared suture with stitches and fibrin adhesive, and concluded that latter owns more advantages than the former. These advantages comprise of: minor trauma, more tolerance to the glue and a better fiber arrangement. These authors also report that the tension on the site of anastomosis and the adhesive reabsorption before nerve regeneration are also obstacles for the use of fibrin adhesive. These results were also observed by BECKER et al. (1985)15, FALDINI et al.16 (1984), FELDMAN et al. (1987)17 and BENTO & MINITI (1989)5. BENTO & MINITI (1989)5 showed that epineural suture compared to the use of fibrin adhesive in complete nerve anastomosis did not present any significant difference in induced injuries of intratemporal facial nerve in cats. The histological cuts of these nerves show an axonal growth, being similar to a normal growth. The same technique was applied by these authors in a large series of surgeries on sectioned facial nerves, presenting results similar to those described in series in which epineural sutures were used18. MATRAS (1976)19, OCONNOR and SHEA (1982)20, PORTMANN et al. (1982)21, BABIGHIAN (1986)22 and ZINI et al. (1986)23 also made use of fibrin adhesive for stabilizing facial nerve anastomosis in humans and obtained similar results with the groups that underwent conventional suture. STERKERS et al. (1989)24 studied the clinical results of the use of fibrin adhesive in 56 patients who underwent acoustic neurinoma surgery, and in whom the trans-operative section could not be avoided. 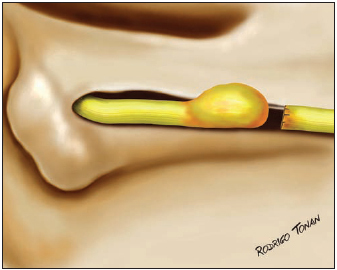 They concluded that the use fibrin adhesive is a safe technique to repair facial nerve. The studied patients remained with peripheral facial paralysis type HB V or VI and were forwarded to evaluation of hypoglossal-facial nerve anastomosis. The use of human fibrin adhesive presented to be efficient when performing these three types of facial nerve anastomosis. The forty-two studied patients and the individuals from group 3 (total graft) present better results statistically confirmed if compared to the ones from group 1 (partial reconstruction and from group 2 (tubulization). 1. Professor of the Othorhinolaryngology Discipline at Faculdade de Medicina da Universidade de São Paulo. (Chairman of the Sociedade Brasileira de Otorrinolaringologia. Head of Ophthalmology and Otorhinolaryngology Department of the Hospital das Clínicas da Faculdade de Medicina da Universidade de São Paulo). 2. Otorhinolaryngology Physician specialized in Otology, Neurotology and Lateral Skull Base Surgery (Collaborator Doctor of the Otorhinolaryngology Discipline of the Faculdade de Medicina da Universidade de São Paulo). 3. Otorhinolaryngology Physician. Doctorate student of Otorhinolaryngology by Faculdade de Medicina da Universidade de São Paulo - HC FMUSP. 4. Otorhinolaryngology Physician (Otorhinolaryngology doctor and trainee in Specialized Complementation in Otological and Skull Base Surgery at Hospital das Clínicas da Faculdade de Medicina da Universidade de São Paulo - HC FMUSP - Brasil). 5. Collaborator Teacher of the Otorhinolaryngology Discipline of the Faculdade de Medicina da Universidade de São Paulo (Assistant doctor of the Otorhinolaryngology division of the Hospital das Clínicas da Faculdade de Medicina da Universidade de São Paulo). This article was submitted to SGP (Sistema de Gestão de Publicações) of R@IO on April 7th, 2007 and approved on June 30th, 2007 at 18:03:59.